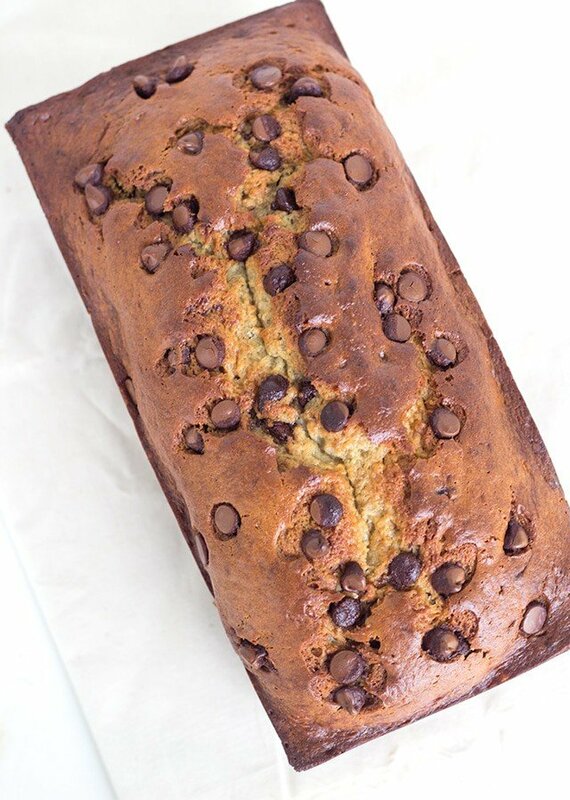 Chocolate chip banana bread. 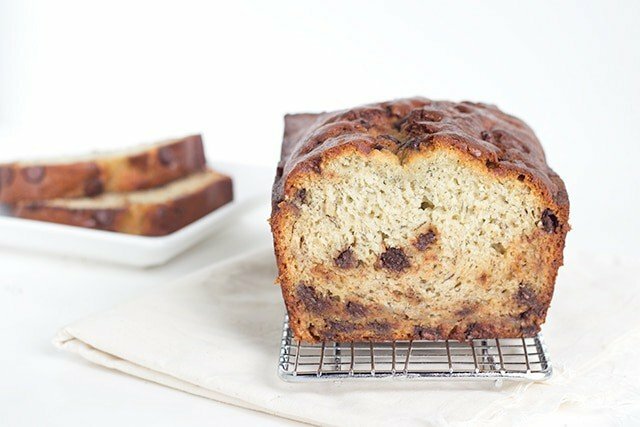 It’s simple to throw together, uses up brown bananas and makes a tasty treat. Sounds like a big, fat score to me. 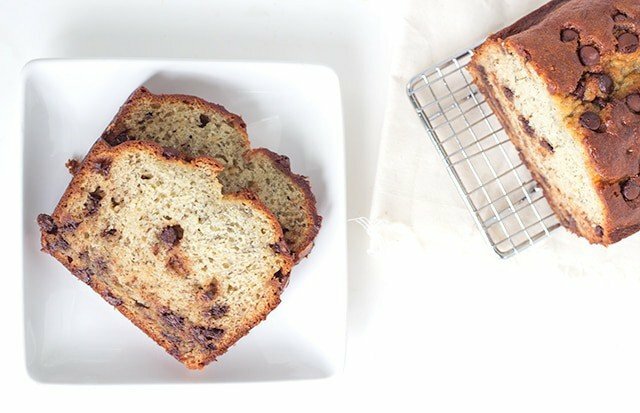 Do you know my favorite way to eat banana bread? Warmed up with some melted butter slathered on the top. What’s yours? Do tell me that’s your favorite way too! Preheat oven to 350 degrees. Spray a loaf pan with non-stick cooking spray. Place a piece of parchment paper in the pan and let it hang over the two sides of the loaf pan. They will act as handles to pull the loaf out. In a large bowl, add in the ripe bananas and mash them with a fork. Add in the vegetable oil and sugar. Mix with a hand mixer until combined. Add in the eggs, and vanilla and mix until incorporated. Add in the sour cream and continue to mix. Scrape down the sides of the bowl. Add in the baking soda, baking powder and flour. Mix until incorporated. Stir in 1 cup of the milk chocolate chips. Pour the batter into the loaf pan. Sprinkle the 1 tablespoon of milk chocolate chips on top of the batter. Place into the oven and bake for 1 hour 12 minutes or until done. Place a tooth pick into the center of the loaf and if it comes out clean or with moist crumbs, it is done. If it comes out with batter, give it an additional few minutes before testing again. 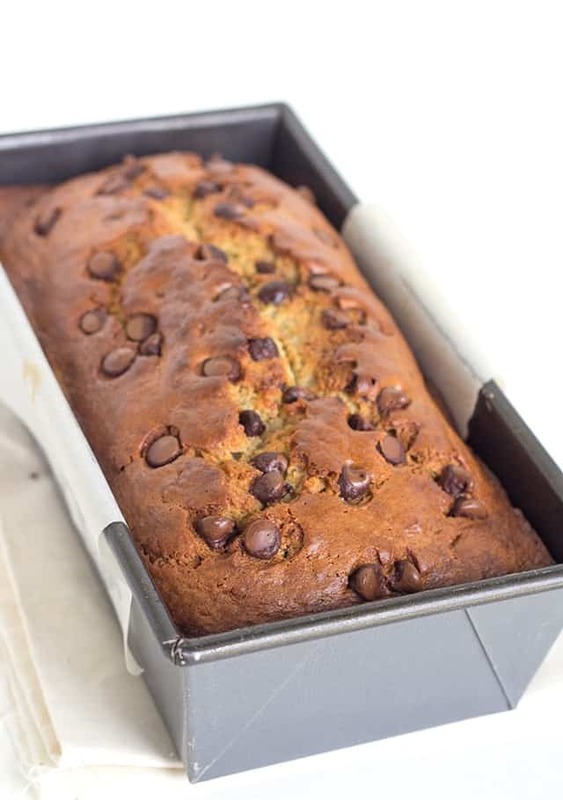 Let the chocolate chip banana bread cool completely and then pull out of the loaf pan. Cut and serve. If you cut it while it's still hot, you won't get clean slices, but it will still taste delicious. This sounds delicious! Love anything with chocolate! 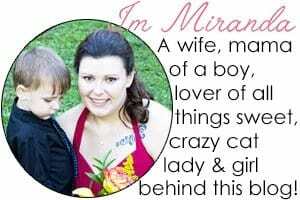 Thanks for sharing at Merry Monday. I have a feeling I could sit down and every bite of a full loaf of this recipe. Gorgeous and yummy, great idea! Thanks for linking up at delicious dishes recipe party! 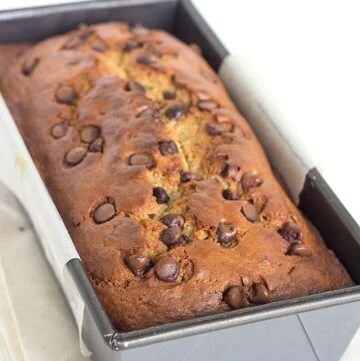 I have a different recipe, but just the same, chocolate chip banana bread is a family favorite. I didn’t have a grandmother to learn from, but I’ve tried to pass down to my kids the joy of mixing, messing and enjoying the process of creating delicious food. That’s an awesome thing to pass down, Laura!